Some very good news for the community of St Norbert! Thanks to the Free Press for providing a comprehensive update on the Market Place and the exciting future about to unfold for our local grocery store! A St. Norbert grocery will rise again. 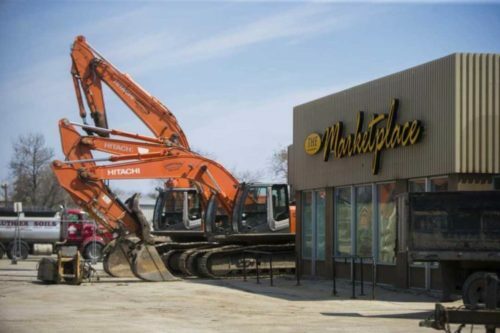 The Marketplace grocery on Pembina Highway that was forced to close due to flooding from a watermain break in January will be rebuilt, Federated Co-op says. Demolition has started and a new store that’s 50 per cent larger in size should take its place by next summer, said Pat Smith, Federated Co-op associate vice-president. The new store will be from 25,000 to 30,000 square feet. “It’s going to be re-developed,” Smith said. The floor layout has yet to be finalized for the 25,000 to 30,000 square-foot building. The drawings, tendering and construction will take about a year to complete, he said. “That’s wonderful news. We’ve been waiting. Everyone’s always asking me if it’s going to reopen,” said area councillor, Janice Lukes (South Winnipeg-St. Norbert ). “That store was more than a store,” she said. St. Norbert prides itself on being a little bit city and a little bit rural. “It’s part of the city but it’s physically past the Perimeter,” she said. The store also had its own bakery and deli that customers raved about. It was a big draw for people commuting to Winnipeg from surrounding areas. They would often pick up groceries from Marketplace on their way home. The store is close to a Manitoba Housing development for people with mobility issues and makes it more convenient for them to purchase their groceries. There are also new condos and apartments in the area catering to retired rural residents who have moved to the city but prefer to reside on the outer fringes. St. Norbert resident Bob Roehle said Marketplace was a community booster that helped the neighbourhood set up its own St. Norbert BIZ (Business Improvement Zone), the smallest BIZ in the city. “Unlike those huge stores that come up, you could run into St. Norbert Marketplace and get your groceries in 20 minutes and get out,” he said. “I imagine some people who are used to big fancy supermarkets might look down on it but 95 per cent of what you wanted was there. It had a home feel to it and you’d run into your neighbours,” Roehle said. Federated Co-op made the decision last week to rebuild after looking at the market and other factors. Smith said the groundswell of support on social media helped persuade the co-op. “The commitment from the community has been very positive. That’s another piece of the puzzle we’re glad to see,” Smith said. It has not yet been determined which co-op will operate the store. It could be Red River Co-op or a co-op from outside the city like Homestead Co-op. It will be renamed. Federated Co-operatives oversees the five Marketplace grocery stores in Winnipeg but has been phasing out the name. Federated Co-op is also in discussions with the city about more parking space because the store will be larger. There were 27 people laid off from the store when it was forced to close. Smith said some were relocated at other stores but others cannot be hired back until the store is back in business.